Submitted by KAT on Wed, 11/11/2009 - 12:08pm. 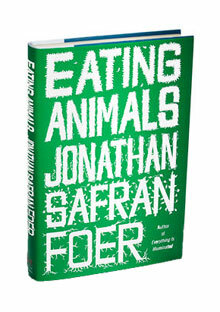 Eating Animals, the searing indictment of factory farming that Jonathan Safran Foer spent three years painstakingly researching, has got the champions of cheap chuck circling their wagons and denouncing the celebrated novelist's latest work as just another piece of fiction. Chuck Jolley, writing for the Cattle News Network, even questions Foer's very identity, describing him as "supposedly a critically acclaimed author of several books of fiction." Jolley, a freelance writer based in Kansas City who evidently distrusts Google and Wikipedia, drew from perhaps more fair and balanced sources to conclude that Foer is part of a "chattering cabal of rarely-been-west-of-the-Hudson River or east-of-the-Cal-Berkeley-campus pseudo-experts who travel on the same midnight train to an eco-purgatory where all food is suspect, meat and poultry is particularly deadly, and the evils of factory farming will force us into an unsustainable, doomed lifestyle that will eventually kill our planet." Slice through the snark and Jolley is spot on, describing the dilemmas posed by industrial agriculture in a nutty nutshell. The arguments in this book are the same old tired accusations that have been made for decades: modern livestock practices are bad, farmers overmedicate their animals, and this will lead to bacteria that are resistant to drugs. These "super bugs" will then infect humans and kill us all. You would think a fiction writer could come up with something more original. Unfortunately for Jolley, Truitt, and their pro-CAFO colleagues, the science is on Foer's side. There is a very real debate about the role of factory farms in the current swine flu outbreak, as the New York Times noted on Monday. Tom Philpott of Grist has been doing some terrific reporting on the apparent link for months. Now, thanks to Foer's mention of the topic on the Ellen Degeneres Show last week, the issue may finally get some play in the MSM. The industrial meat industry accuses Foer of failing to do his homework. In fact, Foer sent multiple letters to Tyson Foods, "the world's largest processor and marketer of beef, chicken, and pork," as Foer notes, politely asking if he could pay a visit to some of their farms. Tyson never responded to any of Foer's seven requests. Perhaps this is simply the literary equivalent of Michael Moore showing up in the lobbies of corporate headquarters, doing his patented song and dance with the security guards, pestering them to let him go upstairs and have a friendly chat with The Powers That Be before they throw him and his camera crew out. In any case, Foer's approach proved to be a similar dead-end. To see for himself just what goes on inside a factory farm, Foer was obliged to seek the help of an animal welfare activist who snuck him into a massive poultry operation in the dead of night. Given the revolting conditions that Foer witnessed himself, and the accounts he provides from others with firsthand exposure to industrialized meat production, you can hardly blame Tyson for ignoring Foer's requests. 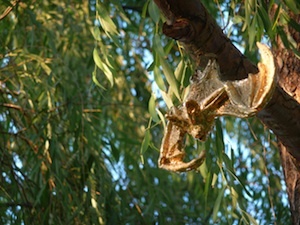 As Foer points out, the most appalling aspect of the industrial meat industry is not the more sensational, flagrant animal abuse that's been captured on undercover videos, but rather the chronic, systematic disregard for the fact that animals are living, breathing creatures not intended to be stacked like pallets or made to steep in their own waste on concrete. Industrial agriculture has done its best to bend these poor creatures to its will, modifying them to better tolerate this style of farming. In so doing, it has created genetic freaks like pigs who can't survive outdoors and turkeys who can't reproduce naturally and have to be artificially inseminated. 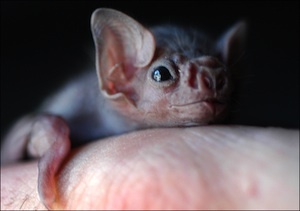 Can anything truly healthy come from a system where disease, deformity, and environmental degradation are the default? Foer's intent with Eating Animals is clearly to start a conversation about whether it's necessary, or justifiable, or ethical, to eat animals. He writes favorably of the farmers who rely on more humane and ecologically sound methods of meat production but concludes that, although these operations are infinitely preferable to their factory farm counterparts, some suffering is inevitably inflicted on the animals. We shouldn't kid ourselves about the number of ethical eating options available to most of us. There isn't enough nonfactory chicken produced in America to feed the population of Staten Island and not enough nonfactory pork to serve New York City, let alone the country. Ethical meat is a promissory note, not a reality. Any ethical-meat advocate who is serious is going to be eating a lot of vegetarian fare. We know, at least, that this decision will help prevent deforestation, curb global warming, reduce pollution, save oil reserves, lessen the burden on rural America, decrease human rights abuses, improve public health, and help eliminate the most systemic animal abuse in world history. Ellen Degeneres noted that some folks will surely feel overwhelmed by the suggestion that they should abandon the cheap meat, dairy, eggs and poultry they count on to feed their families. "How do we take one little step?" she asked Foer. "There is nothing more powerful than an informed conversation, so get informed..talk, talk, talk. Talk about it with your family, don't take these things for granted, don't let corporations lie to you, act on your values." I sometimes worry about being a "carnibore," as the Ethicurean's ever witty Bonnie Powell describes those of us who are only too happy to hector our friends on the merits of pastured meats versus factory farmed. On the other hand, a friend had us over for lunch the other day and served a roasted chicken from a local farm. Another couple invited us for dinner and made a stew with beef and lamb from a butcher who sells only local, grass-fed meats. These are all friends who formerly bought their meats at the supermarket; their choices were a direct result of the many conversations we've had about this subject. This is how a sea change starts, with a few tiny ripples.